There are many different ways you could honour the bard this Burns Night. 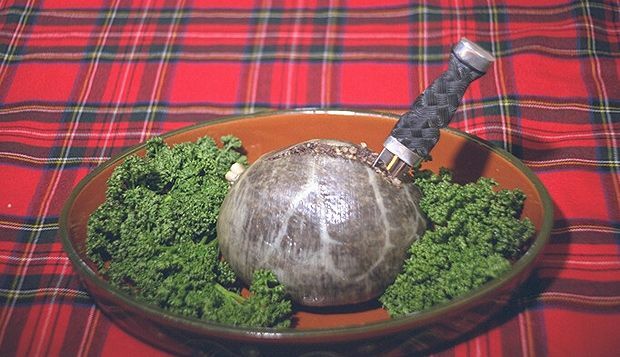 Eating a haggis and cranachan filled Burns Supper is one option but what about reciting a bit of 'Tam o' Shanter' or singing your own rendition of one of Burns' classics? Here are just a few ideas if you're looking for things to do this Burns Night if you're in Glasgow for the bard's birthday. At the Lorne Hotel, Gaia Women will be putting on a special Burns Supper (28 Jan) to commemorate Burns' love of women and his many muses, with music from singer-songwriter Horse McDonald. You can also head to Sloans for their Burns Supper, involving a three-course meal and ceilidh (28 Jan), Trades Hall for the Glasgow Young Professionals Burns Supper and Ceilidh 2017 (21 Jan) or Bothy in the West End, where Johnny Gauld, otherwise known as The Caledonian Cowboy, will be hosting the Burns Night celebrations (25 Jan). Burns Night at Wellpark Brewery (24, 25 Jan) will include a tour of the brewery with haggis, neeps and tatties thrown in as well as a pint of Tennents and some tasters at the end. Ayrshire singer Robyn Stapleton's second album Songs of Robert Burns features some of Burns' most iconic songs. Join her for the launch of the album, which is being held as part of Celtic Connections, on 25 Jan at St Andrews in the Square. Elsewhere, the RCS Wind Orchestra will bring together a programme of music from Scotland for their Burns Celebration (13 Jan) at the Royal Conservatoire of Scotland. Organised by CBCT, in association with BEMIS, From That Lovely Shore (27 Jan) is an evening of international poetry from Anne Connolly, Joe With The Glasses, Gillian Green and Ivad Halafleh at Govanhill Baths. The ticket price includes an alternative Burns supper with veggie haggis, neeps and chapattis. BEMIS' annual Burns bash will return again this year to The Old Fruitmarket for BURNS: A Toast Tae the Lassies (25 Jan), with entertainment provided by Jamaican artist Brina and Pakistani singer Sanam Marvi. The Stand's Burns Night Special, will see Vladimir McTavish, Neil McFarlane and host Susie McCabe taking the reins on 25 Jan and John Gillick, Jim Smith, Jamie MacDonald, Donald Alexander and Janey Godley appearing on 29 Jan. If you're interested in learning more about new research into Burns' work, pop along to Hunterian Museum for Night at the Museum: Extending Burns Heritage (27 Jan). You'll be treated to light installations, live performances, museum object handling as well as food and drink. There'll also be the opportunity to see recently discovered manuscripts and archaeological work. Malmaison Glasgow will be entertaining guests at their Burns Celebration (25 Jan), with host Rick Drysdale, a three-course meal and interactive whisky masterclass. Head to Hilton Glasgow for The Bard and his Belles, an event that will raise vital funds for Beatson Cancer Charity, with a meal, drinks reception and entertainment courtesy of Scottish presenter Alison Walker, World Tam o' Shanter Champion 2015, Susan Chown, Comedian Elaine C. Smith, Scottish politician Annabel Goldie and ceilidh band Well Plaid. Over in Alloway, Burns Alicht (28 Jan) will take you on a special Burns-themed tour around his birthplace. Starting at Burns Cottage, the tour will pass through some notable landmarks that relate to the bard and his poetry before concluding with a finale burning of John Barleycorn, accompanied by tribal drums. As well as the tour and grand finale, your ticket will include an evening of entertainment, with the opportunity to buy food and drink on site. The next day, head back to Burns Cottage for Burns Big Birthday Bash (29 Jan), where you can enjoy free entry to the cottage and even take part in the Alloway 1759 World Haggis Hurling Championships. Take a journey through the history of the Wellpark Brewery with a stop for a dram and a spot of locally sourced haggis, neeps and tatties. A pint of Tennents and some tasters await at the end of the tour. A celebration of recent research into Robert Burns. Booking is essential. Event on sale soon. More information to follow. The RCS Wind Orchestra gears up for Celtic Connections, and Burns Night, with a programme of music from (and influenced by) Scotland, including Peter Graham, Eddie McGuire and Steve Forman. Celebrate Burns Night in style with an evening of top comedy! With John Gillick, Jim Smith, Jamie MacDonald, Donald Alexander and Janey Godley. A Burns Supper to celebrate Burns' love of women with music from Horse McDonald.